This relief in the British Museum may—or may not—show the Hanging Gardens. It is known as The Garden of Sennacherib and it comes from Sennacherib's palace in Kuyunjik (Nineveh). If you compare it with the later descriptions of Babylon's Hanging Gardens, you will find some tantalizing similarities. 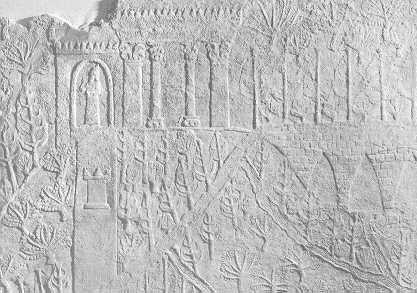 The Kuyunjik relief was suggested as a possible source for Strabo's description by Garden Visit (which has now removed the images from that section of its site). The illustration above comes from another site. The image is somewhat unclear because the relief was always shallow and is now very worn. However, it is described in detail on yet another site, and I have pasted that description below. As the author obliquely suggests, the existence of this relief may undermine the popular attribution of the Hanging Gardens to Nebuchadnezzar. [If the smaller, northern palace [see Koldewey's excavations] has been correctly identified by archaeologists, then it would be] the palace shown in the Assyrian saloon at the British Museum — a building apparently protected by three walls, and adorned with columns resting on the backs of lions in an attitude of walking. On the adjoining slab is a representation of a small building — also with columns—on a hill. A figure of a king sculptured on a stele is seen on the left, with an altar in front of it, showing that divine honors were paid to him. The hill is thickly wooded with trees which may be olives, poplars, etc., and on the right is a series of arches on which other trees are planted. Irrigation channels stretch in a long stream to the left and in shorter streams to the right. As this belongs to the time of Ashur-bani-apli, about 650 BC, and refers to that king’s operations against his brother Samas-sum-ukin, the king of Babylon, it is clear that something similar to the Hanging Gardens existed before the time of Nebuchadrezzar, and therefore, if it was his queen who had them made, before the time of their reputed founder. This would be the point first reached by the Assyrian army when advancing to the attack. Such a park as is represented here with its hills and streams, and thickly planted trees, must have made the palace in the vicinity the pleasantest, in all probability, in all Babylonia, and excited the admiration of every one who visited the sights of the city. An even stronger claim is made in the most recent addition to the Garden Visit site, which cites a printed article by Stephanie Dalley, who suggests that the tablet shows the actual Hanging Gardens of Babylon, and that these were in Nineveh, not Babylon. This author's claim is so radical that (if valid) it would change the whole focus of research on the gardens. The article should therefore be sought out and read. Why not also compare the relief with the description by Philo?